Come join us for 40 Days for Life! 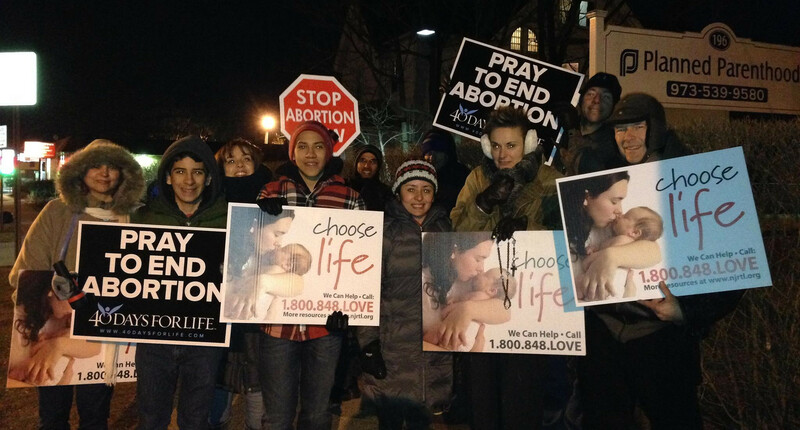 40 Days for Life is about Prayer and Fasting, Peaceful Vigil, and Community Outreach. It is a community-based campaign and vigil that takes a determined, peaceful approach to showing our local community the consequences of abortion in their own neighborhood, for their own friends and families. It puts into action a desire to cooperate with God in the carrying out of His plan for the end of abortion. An estimated average of three chemical abortions per day begin at this facility killing about 1,000 fully formed, pain capable, heart beating, brainwave active unborn babies each year. We invite pro-lifers as individuals or groups to participate. Bring signs to hold (except graphic type) or will supply as needed. Planned Parenthood, 196 Speedwell Avenue, Morristown, N.J. 07960. Your registration in time slots during clinic hours is much preferred and far more likely to save an unborn baby. When you sign up you make it possible to cover all 40 clinic hours! Erratic schedule? Contact the Vigil Coordinator for short notice sign up in a vigil slot at 44LifeUS@gmail.com and receive daily emails on coverage need. We encourage you to sign up so that we know that each hour is covered for a particular day. Spontaneous visitors are also welcome. To sign up for a time slot, please register through 40 Days For Life web site: https://40daysforlife.com/local-campaigns/morristown/. Create a Login or test your old one. We suggest picking an hour or two per week. You can also pick a recurring, weekly time slot throughout the entire campaign. By your registration online you agree to the “Statement of Peace” terms. Alternatively you may email 44lifeus@gmail.com if you are having trouble navigating 40 Days For Life web site.